Mt. Helix Academy is committed to developing young people who excel in academics and who participate in and enjoy a wide variety of extracurricular activities. We encourage our students to develop a life-long commitment to physical fitness and we provide them the opportunities to engage in and to enjoy fitness promoting activities. We also encourage students to pursue new hobbies and skills that will allow them to fill their leisure time with productive, meaningful activities that will truly interest them. To support these goals, Mt. Helix Academy offers a broad range of optional, extra-curricular activities that are organized and coordinated. Included are a variety of intramural sports programs and a host of specialty clubs that inspire learning in a broad range of areas that we have found to be of interest to our students. These programs are offered throughout the year in 8-week sessions. “Yeah team!” Being a good sport includes cheering one another on. 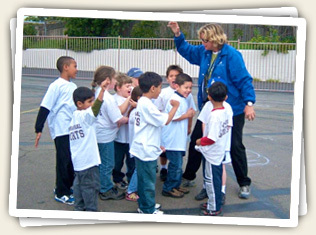 Many, fun and stimulating 6-week, after-school sports and clubs are held throughout the school year depending on student interest. Some examples are listed below. Coding Club, for students in grades 1-9, teaches students to build and test programs that move robots in meaningful ways. Yoga Club, for students in grades 1-9, teaches relaxation and body awareness, with a great workout included. Cooking Club, for students in grades K-9, teaches how to cook easy, tasty recipes at school and then encourages students to try them at home. Lego Engineering, for students in Grades K-5, explores concepts in physics, engineering, and architecture through the construction of bridges, buildings, hoists, and so on. Chess Club, for students in Grades 3-9, makes learning the challenging game of chess really fun. The multiple level curriculum makes the club appropriate for beginners as well as advanced players. Painting Club, for students in grades K-9. Over the eight weeks, students work on their own paintings learning how to mix their own colors, becoming familiar with fundamental principles of art, and acquiring the formal language that helps them to discuss and critique art. ASB, Associated Student Body, is Mt. Helix Academy’s Jr. High student government. The purpose is to organize activities and make suggestions regarding the Jr. High School program. The officers and representatives are elected by the students at the beginning of each school year. Jr. High student dances, organized by ASB, are scheduled three or more times each year. They are designed to provide a safe and socially appropriate fun evening for our Jr. High students, who are chaperoned by their teachers.